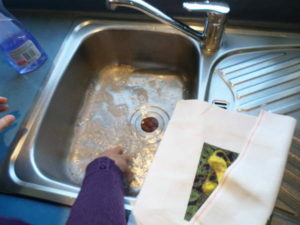 Once you have completed stitching your project you may need to wash it. You do not always have to do this as it depends on the project. If it is just a quick stitch that you are making up to place on a card then you probably wouldn’t bother, but if you have been working on the stitching a design for weeks then it will inevitably have gathered oils and dirt from your hands and dust from the air. After spending so long working on your project it would be a shame to spoil it right at the end, so we recommend that you gently hand-wash in warm water with a little dish washing liquid. Remember the fabric is not really dirty, like a kids T- shirt, so it doesn’t need heavy washing especially if you have used metallic threads or beads. Put warm water in a sink, tub or bowl. Add a small amount of dish washing liquid. 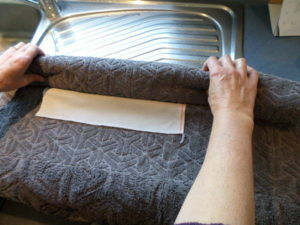 Immerse your fabric and gently swish it around and pat it up & down until you are happy that it is clean. If you have any stubborn stains try Sarb Wonder Soap from your supermarket or Magic Wand satin remover, but again be gentle. If your work is beaded be extra careful as you do not want to damage the beads. 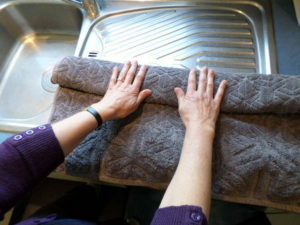 Rinse it in more fresh warm water to get any suds out then lift it out, hold it up so that most of the water drains off. Lay it flat on an opened towel. Roll up the towel and press out the water gently by pushing down on the towel. 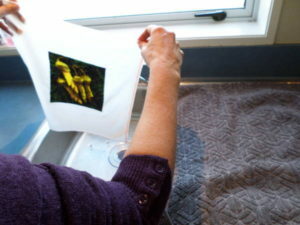 Finally, lay the fabric flat on a clean dry towel, out of the sun, and let it dry. Face-down is best to keep it clean. Once your fabric is dry it can be ironed by placing face down on a fluffy towel and pressing gently with iron. Try not to have iron too hot but just hot enough to remove wrinkles. It is now ready to be laced and framed, or prepared for display. If you are not ready to display the finished work straight away then store it either lying flat, or rolled up inside some fabric e.g. inside a pillow case. 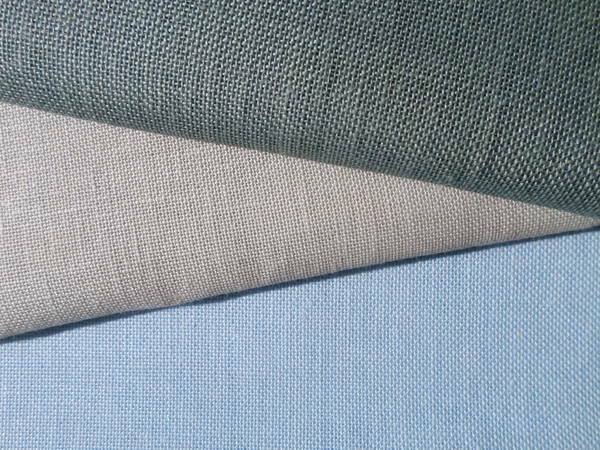 What is the difference between Aida, Evenweave (Lugana) & Linen? 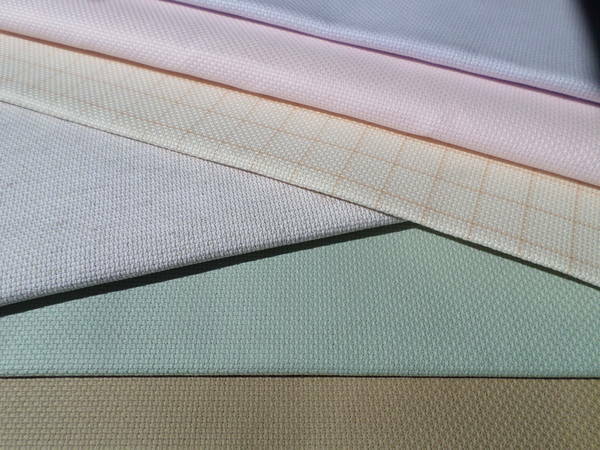 These fabrics can all be used for cross stitch projects, plus some of the Evenweave & Linen can also be used for embroidery designs. So what is the difference, and how do you know which one is right for YOUR project? The answer really depends on what sort of fabric you like, and that only comes with experience & experimenting. If you always use Aida you will never know what Evenweave (often called Lugana) is like, so it is worth trying out the different sorts of fabric to see which you prefer. Aida has a wide colour range. companies making similar products, Zweigart Aida is still the best quality. Aida is made from 100% cotton and is an open-weave fabric. This means that the threads are evenly spaced with clear, easy to see holes so it is perfect for Cross Stitch designs. The fabric has been stiffened so that the threads do not move, which is important when it has such an open weave. Aida is great for everyone from Beginner to Advanced level as it ranges from 6 count up to 20 count (see our blog on the 26th Nov 17 which explains the different counts), so there something to suit all skill levels. 14 count Aida is the most common fabric used in cross stitch kits plus in most designs and it comes in a wide range of colours. crosses end up being very neat and tidy. This gives a lovely crisp look to your finished work. Evenweave fabric is a lot softer than Aida and a lot of people prefer to work with it. Check your pattern when using Evenweave as some patterns say to do stitched ‘over one thread’ and others say ‘over two threads’. What this refers to is how you do your crosses e.g. Stitching ‘over one thread’ is what you normally do on Aida. You are taking your needle up one hole then over one thread and down the next hole. If you stitch the cross ‘over two threads’ you are skipping a hole so you cross two threads and then stitch into the next hole. The effect of this is that if you are using 28 count fabric & stitching over two threads, then the final design size is going to end up the same as if you were using 14 count fabric. This is because 14 is half of 28. I will explain this further in a future blog. 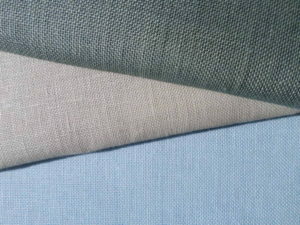 Linen fabric has been made from flax for centuries and it use to be very common in clothing and furnishings. Now-days it is used more exclusively and is seen as something special. It has an uneven natural look with some threads being thicker than others and that is it’s charm. This look can really enhance a stitched design especially if some of the fabric is left unstitched around the design so that the fabric threads can be seen. Like Evenweave it is often cross stitched over two threads but again, check your pattern’s instructions. Choosing which fabric to use is part of the fun of doing a new project. It can be a bit challenging to try something that you have never done before, but it is always good to step outside your comfort zone now and then. We do have smaller pieces of fabric available if you just want to ‘give something a go’ so don’t feel that it will be expensive to try a different fabric. Please feel free to contact us if you want some advice about which fabric to use for your project. We are happy to help! What do the different fabric Count’s mean? Every embroidery and cross stitch design or kit suggests a fabric ‘count’ size that is suitable for that design. But what do they mean by 14 count or 25 count fabric? And how do you know which count is the right one for you? Aida Fabric from 6 ct to 20 ct starting at the top. The count size is worked out on the old system using inches not metric centimetres. So the count is the number of threads per inch. This means that a 14 count fabric has 14 threads in every inch of fabric and a 25 count fabric has 25 threads in every inch. Another way to look at it is using the holes – 14 count fabrics have 14 holes per inch and 25 count fabrics have 25 holes. The lower the count number, the bigger the holes as there are fewer threads taking up space in that inch e.g. a 14 count fabric has bigger holes than a 25 count fabric. This is why a 14 count fabric is more suitable for a beginner than a 25 count, as the holes are easier to see and to pass a needle through. 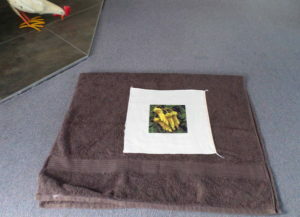 Fabrics used for needlework have counts that range from 3 count all the way up to 56 count, with the 3 count being a rug canvas where you use thick wool to make your rug, and the 56 count would be used for surface embroidery where you would not be counting the threads at all but stitching free-hand to create your design. Most cross stitch work is done on 11, 14, 16 or 18 count Aida fabric which has evenly spaced holes. 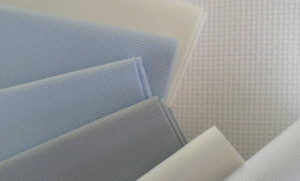 More experienced stitchers could use Evenweave or Linen fabrics which generally range from 20 to 40 count. Embroidery tends to be done on 28 count fabric and upwards but it does vary as you gain in experience and try using different fabrics. We do not always carry stock for every count size so if your pattern calls for a fabric that we don’t appear to have, you are welcome to ask a question as we can often order it in for you. Just use the Contact Us page and let us know what you are wanting. So where do YOU start? And which is the right one for YOU? For a child or an absolute beginner wanting to try cross stitch, 11 count Aida fabric is a good one as it has 11 threads or holes in every inch. With nice big holes it is easy to see where your needle should go next and you can use a big needle and a thick thread. A Cross Stitch kit with fabric, needle and threads included is the best way for a beginner to start, as then you know that you have all the supplies needed and the right size fabric & needle for your level. Kits using 11 count fabrics tend to be simple designs that are easy and quick to stitch. For most people doing cross stitch 14 count Aida fabric is the most common as it is a good, easy, even fabric with good sized holes that are not too big. Most kits that we stock are supplied with 14 count fabric and they are a good way to start as they supply everything you need to make a lovely project. Aida 6 count, 14 count and then 18 count at the top clearly showing there are more threads per inch as the count rises. Kits & patterns can vary in their level of difficulty so do check the ‘Skill Level’ rating that we have allocated to every one we sell. Most 14 count designs are either Beginner or Intermediate level with Intermediate meaning someone who has done a number of cross stitch designs before so feels comfortable with a project that is a bit more challenging. 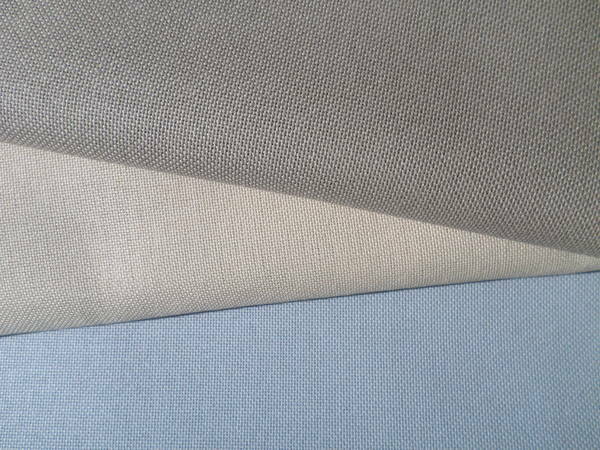 14 count Aida comes in a wide range of colours so if you are working from a pattern and it calls for white or neutral coloured Aida, why not think about using a blue background or a green one or some other colour. A different coloured background can often lift a finished project from just looking nice to looking stunning! Once you have done a number of cross stitch projects on 14 count, it is fun to then try a 16 or 18 count fabric. They are a little harder as the holes are smaller due to the threads being closer together, but your design will have more detail as more colours and stitches fit into that inch of fabric. And more detail means that the finished project will be more dramatic than if you used a smaller count fabric. 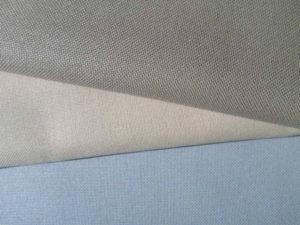 Again the choice of the colour of your fabric could really lift your project into being something special. Some cross stitch designs call for 25 or 28 count fabric. This is suitable for stitchers that we have rated as ‘Advanced’ as it is normally too difficult for a beginner to work with. As there are yet more threads in that inch of fabric, the extra colours & stitches gives greater detail to the design. Sometimes designs using 25 or 28 count fabrics call for stitches to be done over one thread and sometimes over two threads. Read your pattern carefully as this will make a huge difference to the finished size of the design. Working out design sizes will be covered in a future blog. For embroidery designs a fabric is needed with more threads to the inch as you do not count threads like you do with cross stitch. You choose where to place the needle to make your stitch so the length and direction of your stitches can vary from stitch to stitch so your fabric needs to have more threads per inch than if you were doing cross stitch. Fabrics can range from 28 count upwards so be guided by your pattern instructions. For embroidery designs a fabric is needed with more threads to the inch as you do not count threads like you do with cross stitch. You choose where to place the needle to make your stitch so the length and direction of your stitches can vary from stitch to stitch. Therefore you do not want to use fabric that has too many holes as that can limit where you insert your needle. Hardanger embroidery is the exception as you do need to count threads for that style, and 20 count Evenweave is the best fabric for that. Most other embroidery stitches are done on the surface so the fabric should be 32 count upwards but be guided by your pattern instructions. Choosing the best fabric for your project is always a fun part of the process as the count size & colour play a big part in how the final design will look. Be guided by your pattern instructions but don’t let them limit you to the ‘same old, same old’ that you have always used. Making a design bigger or smaller, with a different coloured background can make a design so individual and a unique piece of art work. Please feel free to Contact Us if you want any advice. Be bold and try a different count and you might just amaze yourself!